← White Orb Appears, Moves Quickly, Arches to Right, Vanishes. Silent Transparent V Shaped Flies Low & Slow. Description: My wife and I witnessed this exact same V shape UFO flying low and slow. There was no sound coming off it at all. It was transparent, but you could see the outer lines of the craft. It was a pretty awesome experience. This was in Bakersfield,California on 9/7/17. Time: 7:05 p.m. and 7:55 p.m.
Hi, my name is (name removed). I had a sighting of a V shaped craft on 20 April 2010 at 19:55 p.m. and again last night 28 March 2012 at 19:05 p.m. The craft looked transparent, had no lights, made no sound. The first and second time I noticed how it was moving through the clouds, almost like vapor coming off it. Image Left: Click on image left for larger view. We live in Johannesburg South Africa. 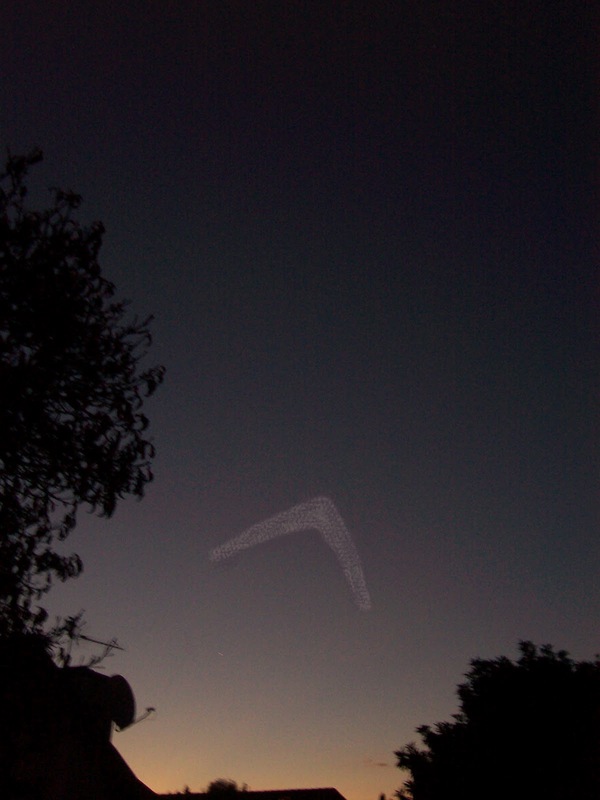 I edited a photo of the night sky, where it was see, and added the V shaped craft. I am in the process of getting some night vision equipment. I really hope to get some footage soon. Thank you for taking the time to read about my sighting. Kind Regards. This entry was posted in UFO Sightings 2017, UFO sightings California, Unidentified, V shaped and tagged Low flying, Slow movement, Transparent. Bookmark the permalink. 4 Responses to Silent Transparent V Shaped Flies Low & Slow. I witnessed 2 sightings similar to these, one was last night flying south to north very fast, but so smooth. There was no noise at all. It was so transparent that you almost couldn’t see it. This was a cigar shaped craft with the broad side of it coming at me. It was very long maybe 1 mile wide? The height was hard to say, but maybe 15,000 feet up. It was moving faster than any fighter jet I have seen. I forgot to mention this was in northwestern Arizona a few hours south of Vegas. The second sighting was back in 2014 in the summer. It was almost the same exact setting as my sighting last night being a transparent looking craft, but this one was more boomerang shaped, but not by much. It was just a slight point in the middle that gave it that shape. Otherwise it would of had that straight cigar shape. The difference was that this craft had to be so big as it almost appeared to be out with the stars! Either that or it was flying higher than anything you could see with the naked eye. If I had blinked, I would of missed it. It was flying north to south covering a vast amount of space in a flash. It suddenly made a very odd jump from east to west then continued on north and was gone. Nothing I know of could fly that quickly and make a lateral move like this? Both sightings I will never forgot and I was very excited to see another one a few years after. Both crafts were transparent and basically you could see through them? It would be very easy to miss it unless you get lucky enough to look directly at it and notice the movement. There was not a breathe of noise from either one. Greetings again Mr. Puckett, and my sincere thanks to the Bakersfield couple who took the initiative and perhaps the courage to send their sighting report into you, sir. I know that I have told you that this or a similar object was seen by the University of Missouri Professor Harley and his study group in the Cape Girardeau area, and described it as very fast, dead silent, and seemingly translucent or transparent as it passed over their location. When I first read their study, I had never heard of any sort of ‘boomerang’ shaped UFO’s and when they mentioned that they thought that they could actually see the stars ‘through’ the object, I pretty much dismissed this report as their ‘wild and wishful’ minds being in overdrive, but as time passed, I came across more than several more of these sighting reports including from people who I would never think would likely see or report such things! I conclude that these are ‘real’, but there is still the questions of just whose they are and more importantly: What are they doing as they overfly our Country and or the rest of the globe? Again, thank you all! Thanks for your comments. Yes, I have the book about Dr. Harley Rutledge. He is one of a few noteworthy scientists that took the risk of studying UFO’s.